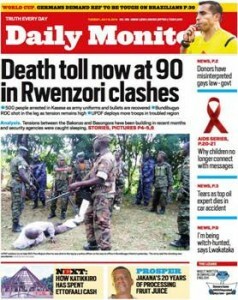 The tough looking royal guards, smartly dressed in their Rwenzururu attire, took vintage positions-as the motorcade carrying the amiable and benign queen of the Obusinga bwa Rwenzururu Kingdom pulled into the drive-way at KRC Offices, Fort portal. This was not just an ordinary visit the queen was making. 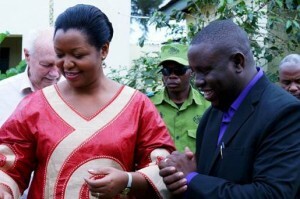 Not at all-as the soft spoken light-skinned queen made it clear to all, that enough blood had been shed -and it was time to heal the wounds among the various ethnicities in the Rwenzori Region, and work together to bring lasting peace. The Queen was received by over 30 members of the Board and Staff, led by the Executive Director, Mr. Julius Mwanga who could not hide his delight as he hailed the Queen and applauded the Rwenzururu Kingdom for the initiatives they have taken to improve the livelihoods of the people and the recently launched Peace initiative under the Rwenzururu Nyabaghole Foundation(RWENFOD), to foster peaceful co-existence in the Rwenzori region. The initiative was started by the Rwenzururu King, Charles Wesley Mumbere Irema Ngoma and the queen with an aim of fostering peace and development in the Region. Maurice Barnes, who sits on KRC board, applauded the queen for her efforts in promoting peaceful co-existence among the kingdom subjects and the region at large. 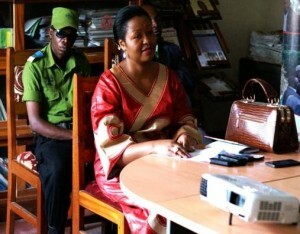 She stressed that Rwenzururu Royal Guards are not warriors but guards of the royal family of OBR. The Queen revealed that the Kingdom was undertaking various developmental projects which included: poverty alleviation initiatives, youth development programs, health and economic improvement. She pledged to participate in the upcoming youth campfire and provide career guidance to the participants. The peace dinner was organized under her initiative, Nyabaghole Development Foundation, a development initiative that she initiated in 2011. 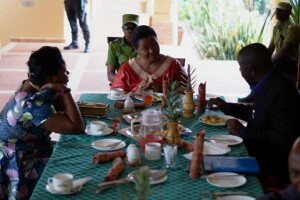 The dinner the first of its kind was graced by the Speaker of the Parliament of Uganda, Rt. Hon.Alitwala Rebecca Kadaga. In attendance was the leader of Opposition in parliament, Hon. 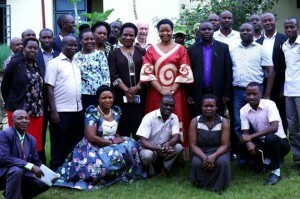 Winnie Kiiza, and area members of Parliament from Kasese district. The Nyabaghole peace dinner comes at the time when the region is engulfed in several violence epis odes, with the recent ones happening in late November. It must be recalled that in 2014 and election related violence after the 2016 general elections, cultural institutions, especially Obusinga Bwa Rwenzururu and Obudinghiya Bwa Bwamba were allegedly implicated in having contributed to the violence. The Obusinga were particularly blamed because of their royal guards that were alleged to have participated in the violence. The executive director of KRC, Mr. Julius Mwanga, appealed to leaders at all levels to promote peace instead of dividing people for their own good. He reminded them of the urgent need to foster reconciliation among the people who were affected by the conflict. Ms. Bihunirwa Medius presented the communiqué from the Rwenzori Peace Women Forum- an Initiative recently founded out of the gender training of women leaders funded by USAID-SAFE and held in collaboration with KRC. 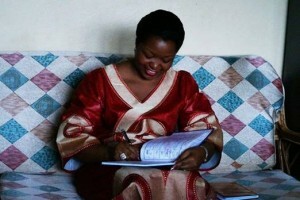 She said that the initiative was looking forward to work with the Nyabaghole Development Foundation. The current conflicts in the Rwenzori Region took a nose-dive and degenerated into a tribal crescendo after the February elections, mainly in Kasese and Bundibugyo Districts. This was exacerbated by lack of a coherent approach towards addressing the issues-as various ethnicities begun making counter accusations. It’s now hoped that with Rwenzururu Kingdom coming in to take lead in resolving the conflicts, then there is a ray of hope. These clashes mainly pitted the Bakonzo against erstwhile friends the Bamba/Babwisi as they clashed and maimed each other. Most sources claimed the clashes were exacerbated by the establishment of a rival cultural institution in Bundibugyo and yet Mumbere was the defacto leader of both tribes, having inherited the then Rwenuzuru Movement-which had broken from Tooro, from his father Isaya Mukirane, in the 60s. The two tribes of Bamba and Bakonzo fought Tooro jointly and broke away to form their own kingdom . Even when government was recognizing the Obusinga bwa Rwenzuru later in the 2000s, he was called the King of Bakonjo and Bamba. However the relationship got estranged as the Bamba demanded their own separate kingdom –which they were granted around early 2014 and installed their own king Lt Colonel Kamya. 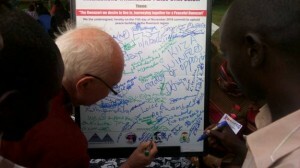 This is said to have not gone well the Rwenzururu leadership and supporters, thus the clashes. Various efforts by the government team led by Capt Mike Mukula later yielded results when the two kings met and signed a memorandum to work together for peace. We appreciate the work done by the Queen of rwenzururu kingdom to restore peace and stability in our district and kingdom at large. J ague the queen to bring also the people the. Guards into jesus way .for it’s said that these people they entered witch craft and were dicived that no bullet would pass through hence claiming all there lives. Uganda currently it’s in the hands of God and God never work with witchcraft. Otherwise may Almighty God have mercy upon our king. And set him free from all the challenges his undergoing.